Thank you for your props in response to my Mexico/birthday themed Marvelous In My Monday post! I really appreciate it, especially after my less frequent blogging as of late. But I still have more to say about my 25th birthday, which was this past Saturday. When I wrote the MIMM post, I was on the airplane and it was my birthday afternoon. I was feelin’ good! However the evening presented new challenges. I overcame them, but my birthday weekend wasn’t completely the rosy picture that my last post painted. Before boarding the plane though, I did make a new friend from Ohio. 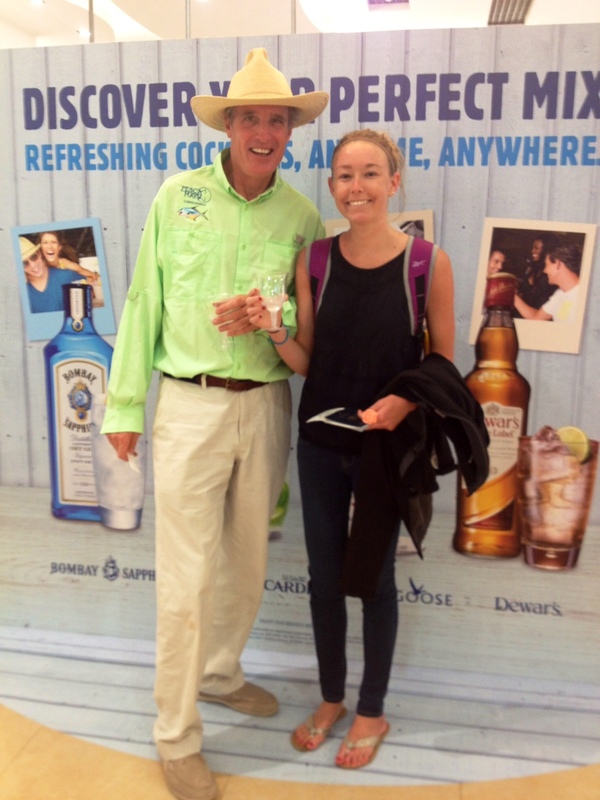 He wanted to pose with me as I showed off the gin & tonic sample I received IN THE AIRPORT. Gotta love the duty-free shop in Mexico. I had birthday dinner plans at my favorite restaurant, J Gilbert’s, with my very close friend (and blog namer, I can’t not mention that) Rachel. It was my first time seeing her since my move to Boston and also my first time seeing her since she got engaged! We started the evening off right with our barrel-aged Manhattans (or as we like to call him, Mr. Manhattan). I don’t know where my blogging mojo has gone, but I’ve lost it like Austin Powers and am not feeling motivated right now to blog. The perfectionist in me though feels bad about not blogging since I didn’t do so yesterday, so here I am! It’s officially my last week as a CT resident and I’ve continued to make steady progress in my transition to Boston. I visited my new apartment this past Saturday to pick up my keys and drop off a huge load of stuff. My mom and brother came along to help and they both loved my place! I’m so pumped to get the big move done this Saturday so that I can finally start getting settled and setting up. My dad will be along for that ride, and is even going to stay over in a hotel Saturday night so he can be around Sunday. I’m going to take him to dinner at the fab restaurant I visited after my interview – West Bridge! They had plenty more cocktails I wanted to try, so a return visit is a must. The winner of the Ellovi Body Butter giveaway is Mahdi! Congratulations and look for an email from me about getting you your free jar of raw six-ingredient body butter. Remember if you didn’t win you can get 15% off (click here to purchase a jar) by entering offer code “caitplusate”. I went into the weekend wary of how I would handle my plans to visit my good friend/former neighbor Molly in Boston on Saturday night. I still wasn’t feeling good about myself after Wednesday night’s dinner out and was doing a lot of future-tripping over the guilt I would surely feel after a day and night of restaurant hopping in Beantown. For that reason I made sure to keep Friday night low-key and stayed in my hometown. Of course everything turned out marvelous in the end, as it often does. I’ve got another weekend of excellent memories and moments I’d re-live again in an instant, even if they also came with some not-so-kind thoughts toward myself. Share your marvelous via Katie’s link-up! I received complimentary admission to this event in exchange for a blog post about my experience. All opinions are my own. This past Friday night I had the opportunity to attend my second cooking class (read about my first one here) at Pond House Grille in Glastonbury, CT. The restaurant has been doing one class per month, and with Thanksgiving coming up this one was appropriately themed “Spice Up Your Side Dishes”. This month’s class had enough participants to be held in a bigger room in the restaurant’s adjacent banquet facility. All classes are taught by Executive Chef Jordan Stein but I wouldn’t exactly call it teaching…hosting is a more accurate word. Jordan is so great with his guests! I felt like I was in his home and he was letting us all help him make Thanksgiving dinner. He made sure every “student” got some hands-on cooking time in. He would demo each step and afterwards pass it off to a volunteer – or someone he chose. Some guests were hesitant to volunteer and Jordan did a wonderful job of encouraging them to do so. I attended this event free of charge as a media volunteer. All opinions of the evening are my own. 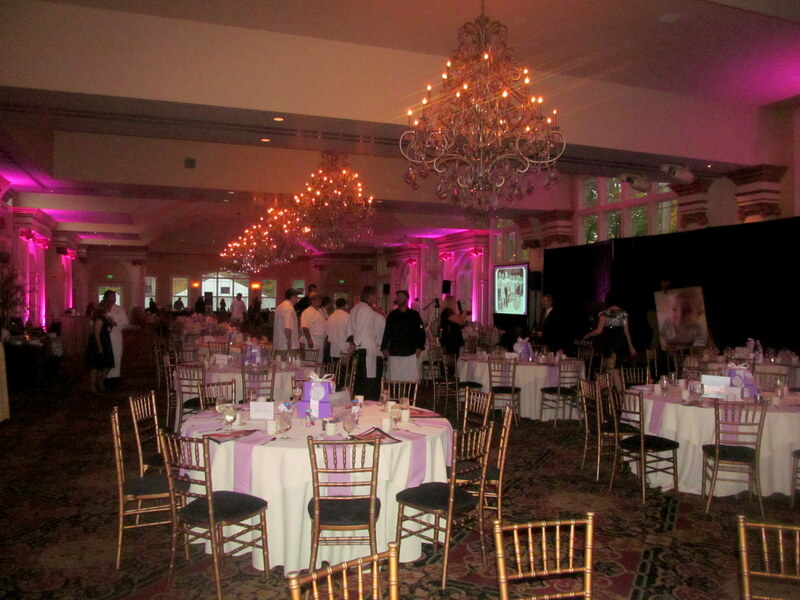 You’ve heard me talk about the 75th Anniversary March of Dimes Signature Chefs Auction Gala a few times now. 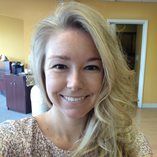 The event seemed so far away when I first connected with Leigh-Anne Lefurge, State Director of Communications for the Connecticut chapter. She, Marc Spencer (Senior Community Director), Kaitlin, and I worked together to spread the word via social media and get more restaurants involved. I could hardly believe it when I woke up this past Thursday morning knowing the event was already here! Right before kicking things off. 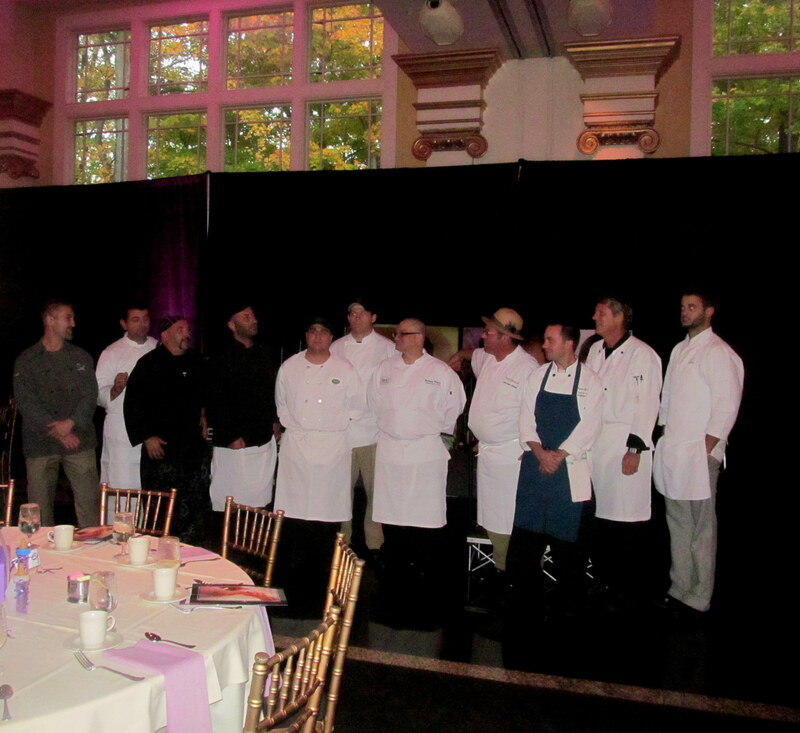 Some of the evening’s chefs, assembled for a group shot. Oddball at Real Art Ways – Giveaway! Remember to check out Friday’s post for a link to a Physique 57 online workout code that will give you a free 48 hours of access – up until 10/31! This Saturday 10/26 I will be attending the Halloween event of the season – the 2013 Oddball at Real Art Ways in Hartford! Ticket proceeds will benefit Real Art Ways, an art organization that shows independent films, commissions public projects, and puts on other live and visual arts based events. This is the fifth year of the masquerade ball featuring “tricked-out art galleries, eerie photo opps, and outrageous tunes”. Doors open at 8PM! The $65 ticket includes a specialty Absolut cocktail and food from some of the area’s best restaurants – Max’s Oyster Bar, ON20, Pond House Grille, Firebox, and Republic. Trust me, their food is good…I’ve been to all of them except ON20, but given all the awards they win and the fact that one of my favorite mixologists Brent Bushong is now in charge of their bar food and cocktail menu, I’m comfortable saying they’ll have some delicious offerings. I actually had dinner at Pond House Grille on Saturday night. They’re doing all-hours happy hour food right now – buy 1, get 1 for a penny. These are the Gorgonzola sweet potatoes and crab cake croquettes. I enjoyed both, ESPECIALLY the sweet potatoes. Pond House Grille provided me complimentary admission to this cooking class. This is not a sponsored post, and all opinions on my experience are my own. Pond House Grille has revitalized not just its appearance (examples: shiny website, tablet menu format) but also its food. Executive Chef Jordan Stein is placing a huge emphasis on seasonally appropriate and creative cuisine which makes heavy use of local ingredients. I had the privilege of receiving a chef’s tasting there not long ago, and was truly blown away by the dishes this talented and humble guy served up. My guest and I received a complimentary chef’s tasting for the purpose of writing this post. Beverages were not included. All thoughts and opinions about the experience are my own. 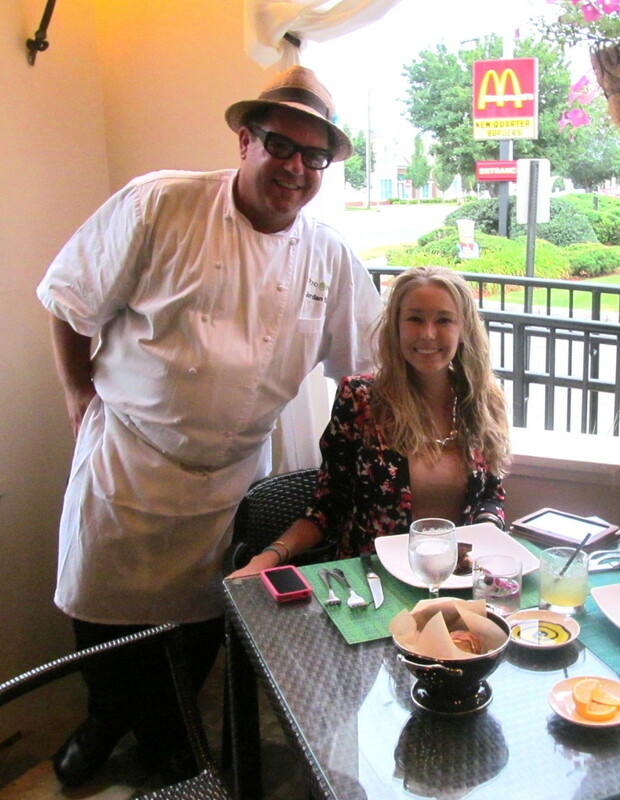 I’ve dined at Pond House Grille several times before, and enjoyed each experience. But they recently re-did their menu and I’ve been anxious to sample Chef Jordan Stein’s creative dishes for awhile now. 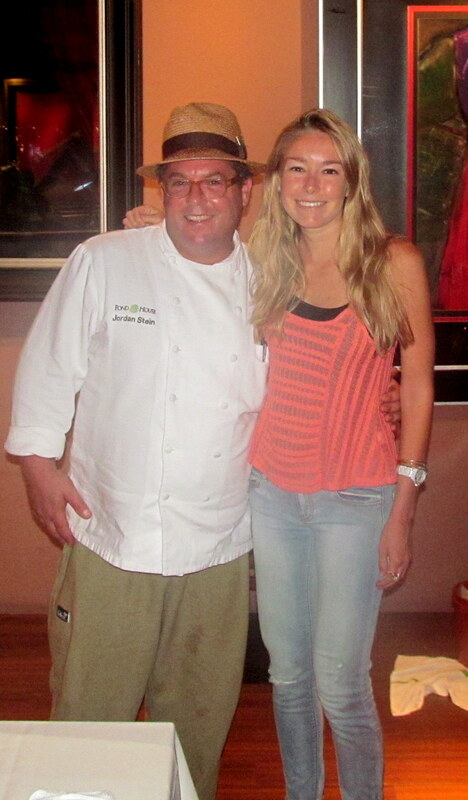 Thankfully, Pond House invited me and a guest to come in and do just that via a special chef’s tasting, complete with an explanation of each dish by Jordan himself. Jordan and I! I love his hat and glasses. They’re his trademark! Please ignore the McDonald’s sign in the background ruining this photo. I asked Jill to join me because she is a fellow foodie who will try anything (after all, we have shared worms and scorpions in the past). I knew she’d appreciate this opportunity as much as I did! The winner of the Talcott Mountain Music Festival ticket giveaway winner is Tiffany! Your tickets are in the mail 🙂 Thank you to all who entered and remember that you can still purchase tickets to the next two shows here! Happy Marvelous In My Monday! Last night I was COMPLETELY wiped from a weekend of fun…and still felt wiped this morning (hello, Monday). I had one night of not enough sleep (Friday) and one good night’s sleep (Saturday), but that good night was not enough to make up for Friday. Friday was definitely the most energy-exerting, fun, friend-filled, delicious part of my weekend. The rest was great too, but you will find today’s MIMM post heavy on the Friday. Thanks Katie for the marvelous mindset! Marvelous is…a chef’s tasting at Pond House Grille! My good friend Jill and I had the privilege of experiencing a tasting of small plates, prepared for us by Executive Chef Jordan Stein, for dinner on Friday night. We also sipped on some magnificently crafted cocktails and experienced a floral course, involving dry ice! I will be doing a full blog post this week about the experience so stay tuned. For now I’ll be a tease (though some of you may have gotten a sneak peek of more photos on Instagram). I can’t wait to attend Taste of the Nation Hartford tonight with my blends Kaitlin & Kelly! You can still get tickets at the door – general admission is $75, but I’ve been to this event before and it is WORTH IT. Best food tasting event I’ve ever experienced! 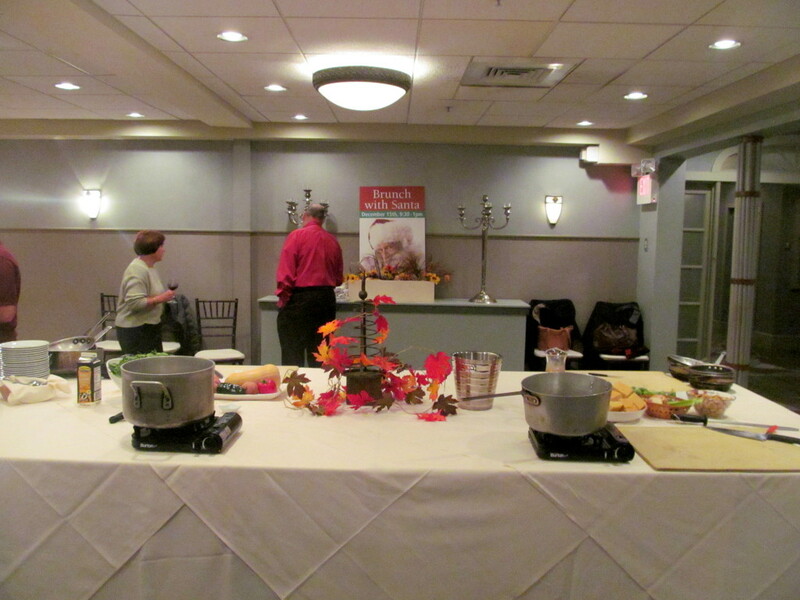 I’m so excited to share my experience judging the Connecticut Historical Society‘s first Community Cookoff! Held last Friday from 5:30-7:30pm (nice and early! ), the event attracted a good crowd and had the work day craaaaawling by as I anxiously waited for the clock to hit 5 so I could hit the road for Hartford. I wore my latest splurge – a Lilly Pulitzer top that I got on sale in FL – for such an important event! Little did I know Lilly herself would pass away in a couple of days. I walked into CHS and was greeted by the smiling, excited faces of Jenny Steadman and Ed Main. They are the ones who came up with this idea, included me, and even planned the event’s timing around my vacation schedule. I couldn’t have felt any more special thanks to them!